147-meter luxury yacht was built especially for the Mansour bin Zayed, Deputy Prime Minister of the United Arab Emirates. Work on it was carried out by British designer Tim Heywood and lasted almost four years. It offers several pools, halls for training, cinema, jacuzzi and a helipad. Leonardo DiCaprio even rented it to vacation with your friends. Megayahta Topaz is a luxury motor yacht built at the Lurssen shipyard. The interior of the yacht was designed by the studio Terence Disdale Design, and the exterior was designed by Tim Heywood. The yacht was launched in May 2012 and Topaz drew with the Prince Abdulazizis superyacht in obtaining the title of the fifth largest private yacht in the world, as both buildings are 147 meters in length. The 147-meter-long ship has a width of 21.50 meters and a gross tonnage of 11,589 tons, and the cost of the mega-yacht is estimated at € 400 million. Topaz has a steel displacement housing, an aluminum superstructure, and consists of eight floors. 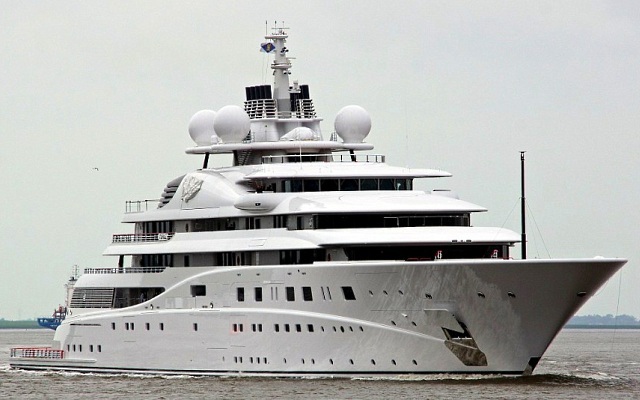 Topaz is also the largest luxury yacht in the world, launched in 2012. The main engines of Topaz Megayachts were specially designed by Lurssen. The main engines are two diesel Pielstick, each with a capacity of 7990 liters. from. This power is quite enough for a yacht to develop a cruising speed of 22.9 knots, while the maximum speed is more than 25.5 knots. Of the delights of life on board, you can mention the Jacuzzi on the deck, the elevator, two helipads, a swimming pool, a garage for tenders, a bathing platform, an air conditioning system, underwater lights. Also on board there is a fitness room, a cinema hall and a large conference room.